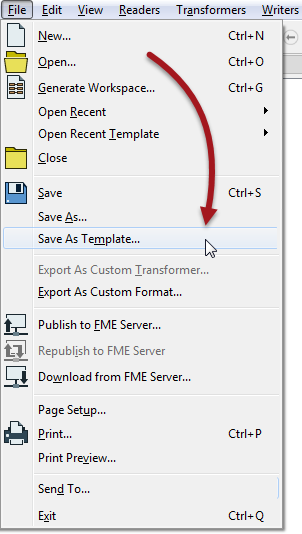 FME Templates are a particularly useful form of shared resource. Like similarly-named items in other software, FME templates are a means of creating a workspace with/from a predesigned format and structure. The closest analogy is to think of templates as a blueprint design. They have their own extension (*.fmwt) and their own storage folder (<user>/FME/Templates). Perhaps the most interesting thing about FME templates is that they can include source datasets within the file. This way both a workspace example, and the data required to run it, can be bundled together and provided to another user. Wrapping up source data and workspace inside a single file makes it a very elegant way of providing a complete set of translation files to another user. When a series of workspaces are all to use the same source or destination data, a template allows the author to duplicate Readers and Writers without having to recreate the workspace each time. Templates are a great way to store a set of processing tasks for re-use. The end-user can simply create a workspace from the template and add their own readers and writers. A template is also a great way to share demos and examples in a way that another user can run immediately. Templates are very useful functionality. You really should be aware of how to create and use them.